Credit will only be issued for products that are returned within 30 days of invoice date in resalable condition and in the original, as well as undamaged, packaging. Please call customer service at 818-340-3433 direct or email us below for a Return Authorization Number (RMA#). If item arrives damaged, buyer must contact Endoscopy Superstore® immediately upon receipt. Merchandise returned without prior permission (RMA#) will not be accepted for credit. The receipt of an RMA # should not be interpreted as a final credit to your account. No credit will be issued for products returned after 30 days from the date of invoice. All products returned after five (5) business days are subject to a 20% restocking fee. Returns must be carefully packed and shipped pre-paid to EndoscopySuperstore®. Shipping charges will be reimbursed if the return was due to an error on the part of EndoscopySuperstore®. When returning products, you must include a copy of the original invoice or packing slip to ensure prompt issuing of credit. In order to prevent the transmission of disease to your and/or Endoscopy Superstore®'s personnel, all products must be cleaned and then sterilized and/or disinfected before sending the products back to Endoscopy Superstore®, who reserves the right to return unclean and contaminated products to you or to charge a “cleaning fee” to handle such products. If any product becomes damaged and is not immediately returned for repair, EndoscopySuperstore® assumes no responsibility or liability for continued use of that damaged product. 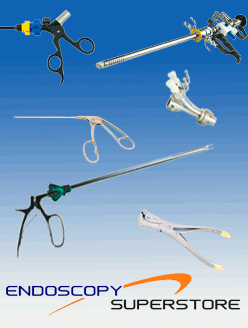 Endoscopy Superstore® does not guarantee the performance of, and may decline to repair or accept for exchange, any product that has been repaired, modified and/or altered by any person or entity other than Endoscopy Superstore® or an authorized repair facility of Endoscopy Superstore®.